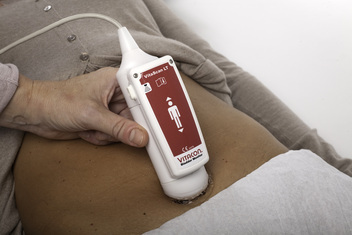 Vitacon is the designer and developer of the VitaScan LT, the first fully automatic USB Ultrasound Bladder Scanner. This advanced bladder scanner is designed to calculate bladder volume using real-time ultrasound imaging without the need for sonographer training. We have designed the most portable bladder volume instrument for long-term care, nursing homes, skilled nursing facilities, acute care, emergency departments, surgery centers, and urology clinics. It is well established that the duration of catheterization is directly related to risk for developing a urinary tract infection. With a catheter in place, the daily risk of developing a urinary tract infection ranges from 3% to 7%. When a catheter remains in place for up to a week, bacteriuria risk increases to 25%; at one month, this risk is nearly 100%. Among those with bacteriuria, 10% will develop symptoms of UTI (fever, dysuria, urgency, frequency, suprapubic tenderness) and up to 3% will further develop bacteremia. How-to Guide: Prevent Catheter-Associated Urinary Tract Infections. Cambridge, MA: Institute for Healthcare Improvement; 2011. (Available at www.ihi.org). According to a 2002 article in the Journal of America Medical Informatics Association, 2 million patients acquire nosocomial (hospital-acquired) infections during hospital stays annually. These infections result in 19,000 deaths annually. The annual cost to treat these infections is $28-$34 billion. According to an estimate from the CDC published in 2001, healthcare-associated UTIs resulted in an excess cost to the U.S. healthcare system of more than $400 million annually. CMS regulations and revised Tag F315 mandate that long-term care facilities appropriately assess and treat the specific bladder disorder of UI and decrease the inappropriate use of indwelling urinary catheters. 1) A resident who does not have an indwelling urinary catheter does not have one inserted unless the resident’s clinical condition demonstrates that it was necessary. Various factors common to elderly individuals may increase the risk of infection including: …… conditions that cause incontinence, and indwelling urinary catheters. Urinary tract infection (UTI) is one of the most common infections occurring in nursing homes and is often related to an indwelling urinary catheter. The incidence of bacteremia is 40 times greater in individuals with a long term indwelling catheter than in those without one. Carries fines of $3550 to $10,000 per day. An example of a severity level 4 deficiency is complications resulting from utilization of a urinary appliance without medical justification or extensive failure in multiple areas of urinary incontinence or catheter management. Carry fines up to $3,000 per day. Examples of this level include failure to provide appropriate catheter care, development of a symptomatic UTI from an unnecessary catheter, failure to assess and manage retention (PVR), decline of failure to improve continence status, and complications due to UI macerations, erosion, embarrassment, and humiliation. The use of non-invasive technology that ensures quality and evidence-based clinical practice is necessary for bladder assessment in the extended care setting. Adoption of technology can preserve the resident's dignity and respect, while ensuring the highest level of bladder function.